New Life in Spain: Carnaval! 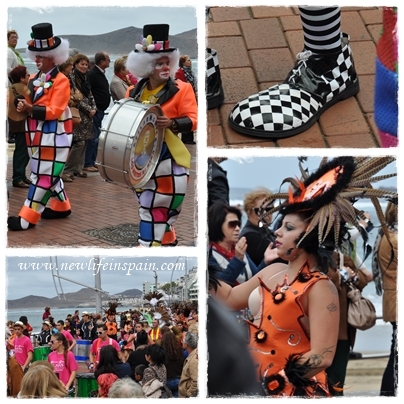 The Carnaval de Las Palmas goes on for almost a month every year. drink ... way too much. 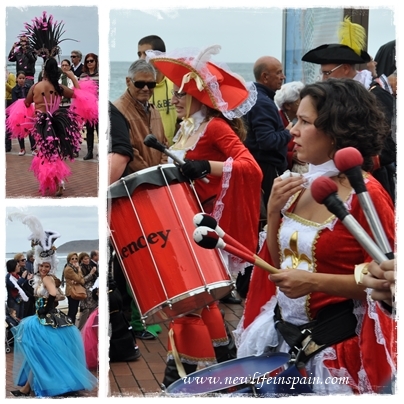 At night there are chiringuitos and live music and daytime, different parades and kids dressing up. 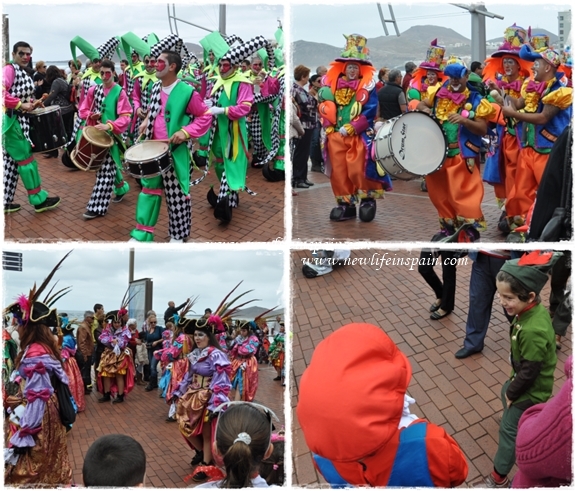 Carnaval is mostly celebrated during the weekends, but yesterday was "Martes de Carnaval", a local holiday here in Las Palmas, and I got to see a parade. 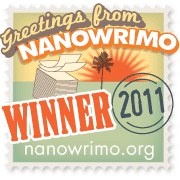 Actually, it passed by right outside my window! 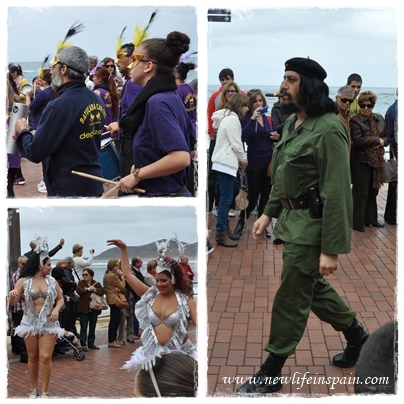 parade passing all the way along the boardwalk of Las Canteras. (There are different kinds of parades during these weeks.) It didn't turn out to be a sunny Carnaval-day though, heavy clouds with a raindrop now and then dominated the sky, but the parade certainly lit up most faces along the boardwalk. 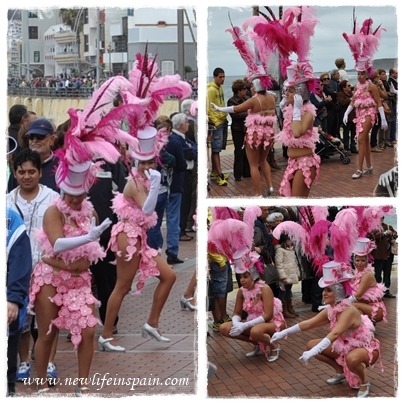 The colours, the costumes, the rhythms and the dancing. Energy! Something I thought about, again and again, was how brave these women are! proudly shaking their behinds and I couldn't help thinking it would not be easy for me to do that! I am ok in a bikini at the beach but this is ... something... completely... different. And it wasn't just skinny girls, far from it but it didn't stop them. Now that is inspiring and just wonderful! And just a few more pictures of some lovely costumes now that I am at it! The costumes are so cool! I love to watch parades like that! Carnival is a big deal in Germany too! I didn't know there was big carnivals in Germany too! In Norway it's just for kids dressing up in kindergarden one day really and nothing more. WOW!! The colors are brilliant! What fun to have these parades right outside your door! everything there look so fabulous.